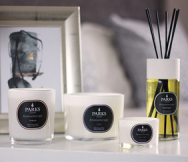 Parks’ premier lemongrass and mint perfume diffuser gift set is supplied in an elegant presentation box, which contains a decorative glass bottle, 100ml of one of our most popular diffuser blends, and a set of premium grade, all-natural reed diffuser wands. Insert just one or two of them to give the air around you only the slightest hint of fragrance, or use them all to envelop a large space with the sophisticated, invigorating scent of lemongrass and mint. Lemongrass forms the complex, herbal base note of this scent symphony. Its tone begins with the sombre, ‘green’ scent of leafy herbs, but it also encompasses the citrus ‘zing’ that gives the plant its name. Mint is a scent that almost everyone can instantly identify, but this is mint with a difference! It is the ‘true’ scent of mint, and you will detect the difference. This combination works amazingly well together, and has been a customer favourite ever since we first introduced it. It enlivens and invigorates, bringing a sense of cool, refreshing breezes even on the hottest of summer days. Better still, its simple purity makes it perfect for those who cannot tolerate candles or harsh perfumes. This premium blended perfume and scent diffuser kit is supplied in a presentation quality gift box that contains everything you will need to change the mood of your home or office for 6-8 weeks of continuous use.